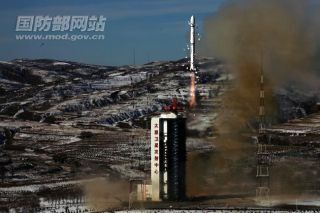 A Chinese Long March 4B rocket lifts off from Taiyuan launching base in Shanxi province on Dec. 22, 2011 to launch a new Earth-mapping satellite. It was the 18th successful launch for China in 2011. For the first time since the dawn of the space age, China's Long March rocket family eclipsed the annual flight rate of the U.S. fleet of space launchers Thursday with the successful deployment of a high-resolution mapping satellite. A Long March 4B booster lifted off at 0326 GMT Thursday (10:26 p.m. EST Wednesday) from the Taiyuan launching base in Shanxi province, according to the state-run Xinhua news agency. The 150-foot-tall rocket released a Ziyuan remote sensing satellite into orbit 13 minutes later, according to the Chinese defense ministry. Chinese officials said the mission was flawless, marking the country's 18th successful space launch in 19 tries this year. The United States is 17-for-18 with flights of the space shuttle and the Atlas, Delta, Taurus and Minotaur rocket systems. No more space launchings are scheduled from China or the United States this year. Russian and Ukrainian launchers have lifted off 33 times this year, but three of those missions ended in at least partial failures. Those numbers include two Soyuz flights from the European-owned spaceport in French Guiana, and a Zenit rocket mission from the commercial U.S.-based Sea Launch platform in the Pacific Ocean. The Ziyuan 1-2C satellite launched Thursday is flying 478 miles above Earth with an orbital inclination of about 98.5 degrees, the defense ministry said in a posting on its website. The 4,630-pound spacecraft was developed by the China Academy of Space Technology and is the country's first high-resolution remote sensing satellite, according Xinhua. But secret spy satellites can likely produce sharper images. Ziyuan 1-2C carries black-and-white and color cameras to provide officials with imagery for land resource surveys, disaster relief services, agriculture development, forestry, water conservation, environmental monitoring, city planning and other applications, according to Xinhua and the Chinese defense ministry. The defense ministry said on its website that China will launch more than 20 satellites in 2012 to "further promote the development of the aerospace industry, national scientific and technological progress and economic development." Missions next year include the launch of at least one human space mission to manually dock with Tiangong 1, a prototype orbital laboratory designed to test technologies for a Chinese space station.